Great to see Mike Badger being commissioned to create a permanent sculpture for Cavern Walks and agree with his desire to not just produce another figurative monument the the Beatles and the past but to try and encompass the whole music scene and also add a bit of humour. It is suspended above the staircase so not easy to see close up but well worth taking a bit of time to study. 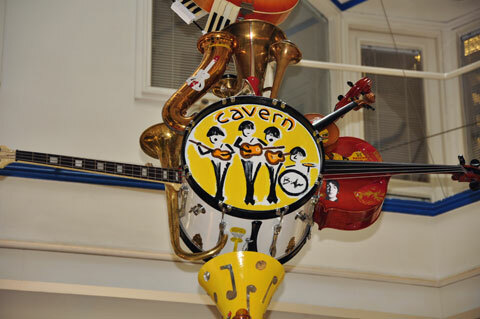 Read on for the full press release info..
Cavern Walks has been celebrating the musical legacy of the fab four after unveiling a permanent sculpture in the shopping centre to mark World Beatles Day. Liverpool based artist and singer-songwriter, Mike Badger, who is well known by music enthusiasts as a founder member of The La’s, was commissioned by the boutique shopping centre to produce a themed-sculpture to mark the city’s third annual Beatles Day, taking place on Saturday 10th July 2010. 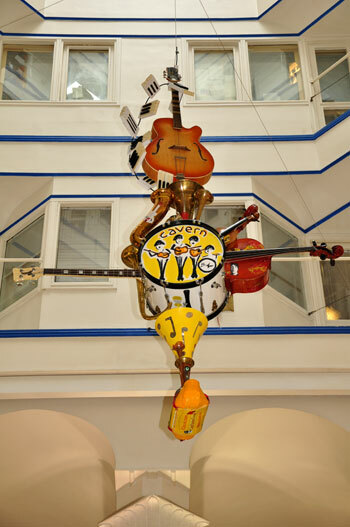 The sculpture, which is entitled “A Musical Composition”, was unveiled to excited shoppers, Beatles enthusiasts and the press on Thursday 8th July. School children from St John Plessington Catholic College on the Wirral, which was recently named TES School of the Year, also attended the event as part of the school’s week-long art project on icons. 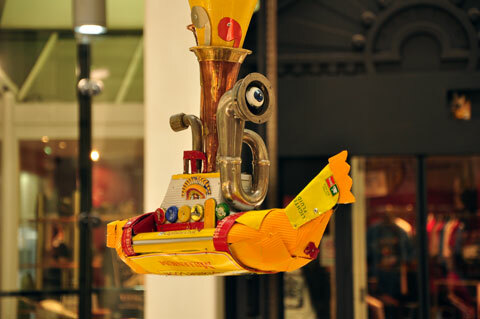 Mike Badger, 48, from Wavertree, who is well known in the art world for his amazing sculpture work using reclaimed materials, also currently runs workshops on recycled materials in schools and galleries. 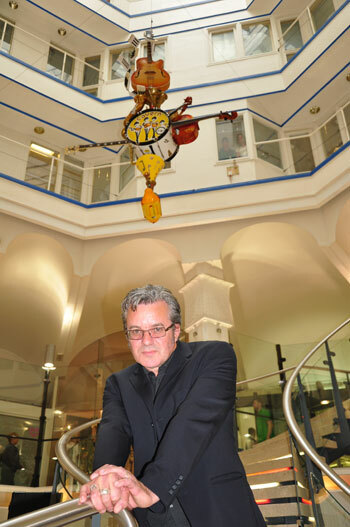 Other commissions/demonstrations produced by Mike to date include: ‘Tin Planet’ in 1998-1999 by local hit makers, Space, ‘The beat goes on’ Local Music Exhibition at Liverpool Museum in 2008 and the Go Superlambannas and Go Penguins project in 2008-2009. He was also the installation artist for The Mersey River Festival from 2001-2004 and artist in residence for ITV Granada in 2006 to celebrate their 50th year. After leaving The La’s, Mike formed The Onset and is currently concentrating on his solo work as well as a collaboration project with musicians from Nashville. Alongside his own musical career, Mike is also a partner in local record label ‘Viper’ who archive Liverpool music.